Most people fail to learn a language before they even begin. Want to know why? Go on a journey with Dr. Shane Dixon as he shares stories of successful and less successful language learners. Dr. Dixon will guide you to understand the scientific reasons for both failure and success. The Language Learner Guidebook, through the lens of cognitive science, language acquisition, and practical know-how, provides powerful tools to help you understand how successful learners actually learn a language. Did you know that you can go on language adventures in your own backyard? It’s true! You’ll be introduced to the language learner ecosystem, a powerful paradigm that will help you find and evaluate resources all around you. This book will invite you to join a growing world of modern language learners who understand that a powerful shift has occurred in language learning. Whether you travel to far off lands, or never leave the comfort of your home, you can harness the power of immersion. Dr. Dixon, with more than twenty years’ experience as a professional language trainer, will share his knowledge not only as a fellow language learner but as someone who has witnessed thousands of others go through the process of acquiring a language. 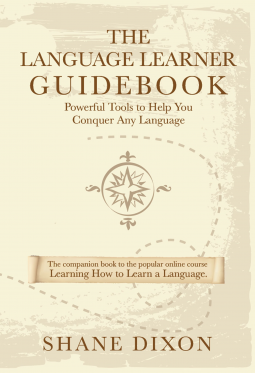 Through stories and examples (and a useful workbook section in the back), this guidebook will allow you to take control of your own language learning by connecting you to strategies and resources that only a modern, immersive approach can provide.